There are few topics in Russian history more appealing and perplexing than the avant-garde efflorescence of the first three decades of the twentieth century. The appeal is obvious, and the reason why so many historians (primarily of art) have been driven to explain it: the poetry, painting, music, photography are all stunning, and shockingly generative even today. The perplexity comes next: how is one supposed to account for this flourishing, which corresponds only imprecisely with both the political revolutions in Russia and related modernist trends abroad? For every master narrative someone puts forth, the exceptions swallow the rule. If we are not going to have a single dominant explanation, therefore, we need as many — and as varied — narrative through-lines, guided paths that encompass some of the heterogeneity without striving to reduce it to a simplistic single cause. 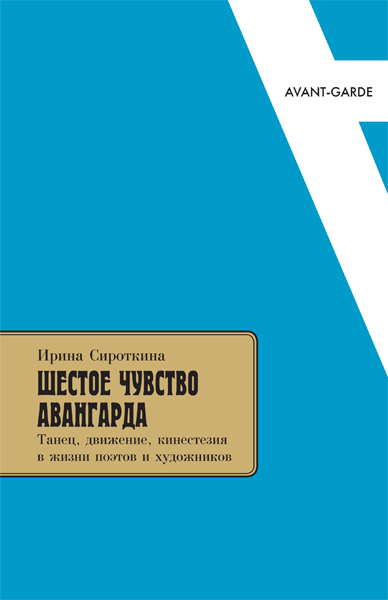 It is in this spirit that Irina Sirotkina advances her new book, Shestoe chuvstvo avangard: Tanets, dvizhenie, kinesteziia v zhizni poetov i khudozhnikov (The Avant-garde’s Sixth Sense: Dance, Movement, Kinesthesia in the Life of Poets and Artists). The book is engagingly written and often revelatory, with many of its surprises stemming from the original approach: considering the avant-garde through the lens of an alternative epistemology. The choice of framing several through-lines around questions in the philosophy of knowledge seems natural to Sirotkina, who is one of the most talented historians of science writing in Russian today. Armed with extensive training in both Russia and the West, she specializes in the history of the human and mind sciences, and is the author of numerous articles in English and Russian. She is perhaps best known outside of Russia for her fascinating monograph, Diagnosing Literary Genius: A Cultural History of Psychiatry in Russia, 1880-1930, which came out with Johns Hopkins University Press in 2002. Since then, she has persisted in thinking historically about Russian theories of the mind-body relationship, expanded to include extensive attention to the arts, especially dance. This was the subject of her 2011 book, Svobodnoe dvizhenie i plasticheskii tanets v Rossii (Free Movement and Plastic Dance in Russia), published by Novoe Literaturnoe Obozrenie in Moscow. The most striking feature of the new monograph is Sirotkina’s presentation of the avant-garde — only a segment, to be sure, but a significant subset at that — through dance, using it as an entry point to a host of other productions ranging from aesthetic manifestoes to futurist poetry. Even just at the straightforward level of a run through a complicated set of personalities and movements, dance proves an inspired choice. Sirotkina’s account shows us transnational connections, with the prominent role of Isadora Duncan as an inspiration and also flashpoint for criticism (throughout, but especially Chapter 3); fads and oscillations between avant-garde and kitsch with the foxtrot and tango crazes (140, 147); a tremendous amount of enthusiasm for dance and movement by leading writers, including Andrei Bely (Chapter 3) and Vladimir Maiakovskii (Chapter 5), painters such as Vasilii Kandinskii (57-58), as well as important theorists such as the four-dimensionalist, P. D. Uspenskii (Chapter 4); and a creative resurrection of invented and actual traditions, as in the “Heptachor (Гептахор),” a group of graduates of the Bestuzhevskii higher education courses for women, under the inspiration of F. F. Zelinskii, who participated in the cultural enthusiasm for ancient Greece, a “Russian Hellas” (Chapter 1). Some of the surprises of Sirotkina’s account come from understating or displacing particular landmarks of the movement. For example, Vsevolod Meyerhold’s “biomechanics” is here integrated as a subsidiary story within a broader context of a culture of movement (156-167). As another instance, rather marginal here is the emerging role of the Soviet state in these developments, a point that has been highlighted in much of the recent scholarship on the avant-garde. Sirotkina is interested in demonstrating other connections, and though we meet the Commissar of Enlightenment, Anatolii Lunacharskii (45), he is treated as one of a large cast of movers (literally) in this choreographic kaleidoscope, as is Lenin’s interest in rational biomechanics (162). Rather more attention is devoted to the scientific experiments conducted by professionals on topics of motion, such as the work of psychologist A. N. Leont’ev (Chapter 2). This is riveting material, and it gives a sense of continuity among diverse groups and diverse artistic media, while not reducing any of them to a simplistic obsession with bodily motion. The central argument of this book, however, is not just that dance mattered, and mattered much more widely than has perhaps been sufficiently recognized. Rather, Sirotkina’s intention is to use dance as a window toward a reinterpretation of the avant-garde, as the first line of the book states clearly: “The avant-garde is not only an artistic project, but an anthropological one, a project in the re-cognition of the person, a renovation of his sensitivity” (7). “Anthropological” is meant here in the Kantian sense of the late Enlightenment, as the (philosophical) science of understanding the nature of humanity. Reflect on the title of this book and you will see Sirotkina’s strategy: dance is central because bodily movement, “muscular feeling,” was considered by some members of the avant-garde as a sixth sense (in contradistinction to other sixth senses across the centuries, such as sexual appetite or telepathy); the senses are the privileged entry points for an empiricist epistemology; therefore, we can use the explicit theorizing and actual artwork of the avant-garde to trace what kind of knowledge this additional sense brought to bear. There are two possible interpretations of this book. On the one hand, Sirotkina might be presenting the implicit epistemology of a core set of avant-garde thinkers and artists — that is, articulating a philosophy that they would have assented to, largely in these terms. The terminology seems to work against this, however. As she notes, “kinesthesia,” an important category, seemingly only entered the dictionary of the Russian language in 1982, although it was present abroad in the twentieth century. That said, nineteenth-century physiologist I. M. Sechenov discussed the possibilities of thinking through motion long before there was an explicit term for it. (Sirotkina discusses this history and the various synonyms for kinesthesia on 18-22.) The other interpretation of Sirotkina’s project, and I believe this is what is intended, is as more of an analytic approach, one which helps us to make sense of the various epistemological gestures of the Russian art world of this era, but one that is more useful for deepening our understanding rather than reflecting what the historical figures would themselves have believed. Her reflections on Emmanuel Levinas, Maurice Merleau-Ponty, and Jacques Derrida (134-135) point more toward this reading. Sirotkina is not entirely clear on which she intends, and it is possible that she hopes for both, blending emic and etic in one thorough analysis. What is the motivation for such an account? “In the traditional epistemological hierarchy, however,” Sirotkina writes, “the relationship between the two types of knowledge are asymmetric: knowing how or what is called practical, technological, bodily knowledge is allocated a lower status, appears subordinate to propositional, theoretical, formalized knowledge” (177). By contrast, “[e]verything written in the book is based on a deep conviction in that besides conceptual thinking there exists also thinking in movements, ‘muscular thinking’” (11), which has particular characteristics: “As we recall, the important property of muscular feeling and haptics is their direct, unmediated character. […] Thanks to this feeling a unique relationship of closeness, of contact with another person and of worlds is created” (134). A somewhat surprising result of this attention to the physical is the downplaying of the visual. There are plenty of visual materials in the book — over twenty pages at the end of portraits, photographs of dance scenes, caricatures, and book covers — but the placement of these at the back instead of in the context of their discussion serves to marginalize sight in this narrative that privileges motion. This might be the choice of the publisher or a deliberate strategy to force the reader away from the common overvaluation of one of the five traditional senses. Sirotkina’s explicit epistemology, surely the point of the book, is at times very persuasive, although the emic/etic tension is such that some of the examples in the book connect much more strongly with her approach while others, while engaging narratives concerning dance and the avant-garde, have less theoretical purchase. It is clear, however, that Sirotkina does not intend this book to be the final articulation of a haptic epistemology, nor to be the definitive book on dance as a sixth sense in the Russian avant-garde, but rather the opening of a perspective and — hopefully — a conversation about the integration of philosophy into the arts at a particular historical moment, and how that could help us think through creativity in the present day. Michael D. Gordin is the Rosengarten Professor of Modern and Contemporary History at Princeton University, where he teaches the history of modern science. He specializes in the history of the physical sciences in North America and Europe, with a particular emphasis on Russia and the Soviet Union. He is the author of five books, including most recently Scientific Babel: How Science Was Done Before and After Global English (University of Chicago Press, 2015). Gordin M. Irina Sirotkina’s Shestoe chuvstvo avangarda: Tanets, dvizhenie, kinesteziia v zhizni poetov i khudozhnikov. Somatosphere. 2015. Available at: http://somatosphere.net/2015/irina-sirotkinas-shestoe-chuvstvo-avangarda-tanets-dvizhenie-kinesteziia-v-zhizni-poetov-i-khudozhnikov.html/. Accessed April 25, 2019. Gordin, Michael. 2015. Irina Sirotkina’s Shestoe chuvstvo avangarda: Tanets, dvizhenie, kinesteziia v zhizni poetov i khudozhnikov. Somatosphere. http://somatosphere.net/2015/irina-sirotkinas-shestoe-chuvstvo-avangarda-tanets-dvizhenie-kinesteziia-v-zhizni-poetov-i-khudozhnikov.html/ (accessed April 25, 2019).